The year was 1968, Jimi Hendrix had already been officially introduced to the American public at the Monterey Pop Festival, the British had already invaded our shores, psychedelic rock was in full swing and Woodstock was just a year away. Socially, politically and artistically it was a tremendous period of change and legendary Blues artists were beginning to be thought of by many as obsolete. Because of British groups like The Rolling Stones, The Yardbirds, The Spencer Davis Group, Fleetwood Mac, Them and Cream, some of these Blues greats found a new audience in Europe. They managed to conduct successful concert tours overseas along side their younger “blue-eyed” and pale-skinned counterparts, but here in their home country of the good old USA, they were quickly being forgotten by the masses. Like in Britain, the USA had young “white” groups, such as The Paul Butterfield Blues Band, trying to carry on the Blues tradition, but for the most part by 1968 the American youth were being drawn to more politically relevant music, albums that pushed the limits of recording and in a bit of irony, recycled Blues music...filtered through wah-wah pedals, fuzz boxes, Marshall Stacks and the young white experience. Clearly there was (and always will be) an audience of the Blues legends, but by the late 1960’s their stars were dimming and Chess Records (the legendary Chicago-based record label that served as the basis for the 2008 film Cadillac Records) decided to go on the offensive. After a few minor failures with “super-group” style jam albums, the label’s next plan of action was to try and hitch their wagon on to the backs of successful psychedelic guitar driven Blues/Rock groups like The Jimi Hendrix Experience and Cream. Under the guidance of producer Marshall Chess (son of Chess Records co-founder Leonard Chess), two of the label’s biggest stars would go into the studio and in an attempt to “modernize” their sound, record what would become two of the most controversial Blues albums of all-time. 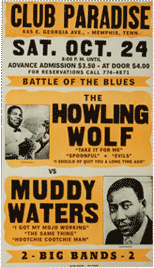 The artists in question were Blues legends Muddy Waters and Howlin’ Wolf and the albums were 1968’s ELECTRIC MUD and 1969’s THE HOWLIN' WOLF ALBUM. The concept was simple, surround the aging Blues giants with hot young Chicago rock musicians, give new “psychedelic” arrangements to some of their classic songs and hope for the best. Upon their releases both albums met with a poor reception, from both critics and fans and were likened to when “Dylan went electric”. In the November 9, 1968 issue of Rolling Stone magazine, writer Pete Welding called ELECTRIC MUD “nothing more than a parody of both Waters’ music and contemporary instrumental practices” and also stated that the album “does a great disservice to one of the blues’ most important innovators, and prostitutes the contemporary styles to which his pioneering efforts have led” (p.11, 1968). Reportedly both Muddy & Howlin’ Wolf disliked the albums and each of them referred the LPs as “dogshit” (Machers and Rockers: Chess Records and the Business of Rock & Roll, p.176, 2004 & Rolling Stone, p.8, 02/15/69). In fact even the cover of THE HOWLIN' WOLF ALBUM reads “This is Howlin’ Wolf’s new album. He doesn’t like it. 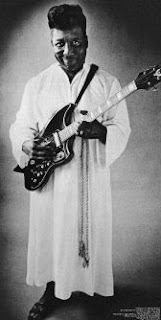 He didn’t like his electric guitar at first either.” Wolf’s effort did not sell as well as Waters’, which was initially Muddy’s biggest record for Chess before word-of-mouth and the press killed its sales almost instantly, after just 6 weeks. Chess Records would later blame the failure of the Wolf LP on the fore mentioned album cover quote. These days you don’t hear much about Howlin’ Wolf’s psychedelic effort, but within the last decade or so ELECTRIC MUD has had a bit of a resurgence and I can’t help but feel that it is, at least in part, due to unwarranted hype. I remember that I first heard the album in college. It was recommended to me by several friends that liked to think they knew a lot about the Blues and though I probably would not have admitted it then, I was not all that thrilled with it. In revisiting the album recently, I can still say that I’m not very pleased with it as a whole, but I am willing to admit that it does have a few interesting moments (such as the little My Girl Outro on She’s Alright and the cover of The Rolling Stones’ Let’s Spend The Night Together). However I ultimately I feel that the album fails at a perfectly viable concept. In his book Lost In The Grooves: Scram’s Capricious Guide To The Music You Missed, of the LP Electric Mud, Gene Sculatti wrote “The rhythm seems to anticipate hip-hop by three decades” (p.244, 2003), which is a theory supported by one of the installments of Martin Scorsese’s acclaimed 2003 PBS documentary series The Blues, in a film titled Godfathers and Sons featuring Chuck D. from Public Enemy. It is notion that I can certainly understand, but it is also one that I happen to think is the source of many of the album's biggest flaws. The band does not seem to be playing with Muddy. 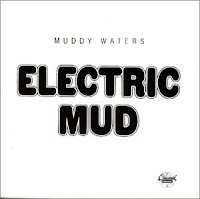 There is no cohesion between the vocals and the band’s playing, as if Muddy’s voice was sampled from previous recordings and just laid over the album’s hard driving, frantic and very noisy backing tracks. Resulting in a sound not unlike the one created with the contemporary sampling methods used in hip-hop. Surprisingly, even though it was less financially successful, I actually find Howlin’ Wolf’s attempt to be a much more pleasurable listening experience. Though at times Wolf’s vocals, like Muddy’s, seem to lack a certain amount of unity with the band, at least the band itself seems to be more focused and collectively driven toward a common musical goal. Through the years it has been documented in print that music artists like Jimi Hendrix, Led Zeppelin and Chuck D. have found inspiration in Waters’ chaotic work of “psychedelic blues”, but I think it is perhaps more telling that The Faces, featuring Rod Stewart and Ronnie Wood and Eric Clapton’s 1970 group Derek & The Dominos, would both adopt the 1969 arrangement of Evil from THE HOWLIN' WOLF ALBUM for their own work. Clearly one of the highlights of the Wolf album, The Faces would use the arrangement in their live performances (a “rehearsal” version being featured in the 2004 box set Five Guys Walk Into A Bar… ) and The Dominos recorded the song for their unfinished 2nd LP (the version did eventually finds its way on to the 1988 Clapton box set Crossroads). Though I may find more enjoyment in Wolf’s LP, I am not necessarily a fan of either record. In the film Godfathers And Sons Marshall Chess, the producer of the albums, claims that they were misunderstood and that they were not meant to be “blues albums”, but I think it is a bit naïve of him to think that two albums, produced by the biggest Blues record label ever, by the two most famous/influential Blues artists of all-time, featuring several of the most recognizable Blues songs ever recorded, could be interpreted any other way by fans. They may have been an attempt at experimentation, but they were Blues albums none the less. It is a little ironic that these first attempts at capturing the “young audience” of the 1960’s with rock musicians and contemporary takes of classic songs would fail so miserably, when within the next three years Chess would find the success they longed for by pairing these legends up with the young Blues virtuosos of the era, producing arguably two greatest “Straight-Blues” albums of all-time, Muddy Waters’ FATHERS AND SONS (1969) and THE LONDON HOWLIN' WOLF SESSIONS (1971). Whether you’re a fan of the psychedelic works of Muddy and The Wolf or not, they are certainly a part of Blues history and worth at least one listen. ELECTRIC MUD also happens to contain one of the greatest pictorial album sleeves ever. I’d like to hear your thoughts on the albums, so please leave your comments below. Check out some NYC Blues with J. Blake & The Earthquake at: www.myspace.com/jblaketheearthquake or http://www.livebluesworld.com/profile/JBlakeTheEarthquake as well as on Facebook. NEW YORK BLUES: The Beat Goes On- Billy Sims Jr. Pleased to be part of this great blues adventure, some of the great blues artists she has met with are: Shannon Curfman, Delta Highway, Roger Earl, Jace Everett, Sue Foley, Sonny Landreth, Moreland & Arbuckle, New Riders of the Purple Sage, Bobby Rush, Gina Sicilia, The women of Saffire, G.E. Smith, Chris Smither, Derek Trucks, and Kim Wilson of the Fabulous Thunderbirds! Monica's passion for music started with songwriting. She has been named as a suggested artist in the VH1 Song of the Year Contest. Her song, The Whiskey's All Gone, placed as number one on the billboard country blues charts on Soundclick.com. Her proudest accomplishment thus far, has been an invitation to perform at a weekday show at the Bluebird Cafe in Nashville! Having honed her skills with intensive one-on-one mentoring sessions with songwriting gurus John Braheny, Rick Beresford, and Debi Cochran, Monica continues to develop her songwriting craft. Monica has studied voice with blues great, Gaye Adegbalola. Kirstie Manna has also mentored Monica on the many aspects of her stage performance as a blues artist. Monica is excited to share her words and music with you!